order now The February meeting of Navajo Canyon Republican Women of California featured Joshua Wilson, executive vice president and media representative for the National Border Council Local 1613. NBPC Local 1613 represents Border Patrol Agents assigned to the San Diego sector of the U.S. Border Patrol. https://stetsonpainting.com/whychooseus/ viagra without a doctor prescription usa We know concerns over border security are at an all-time high and the consequences of unknown people and drugs entering our country illegally have created a dangerous environment on both sides of the border. http://www.santacruzpumas.org/research/ click here The pain and suffering that results from these illegal crossings has reached such a level that it is morally wrong to continue ignoring the situation. It is time for Congress to work to solve this crisis. Now is the time to make your voice heard and let our government know that we want a barrier along our southern border in conjunction with the use of smart technology to help the professionals secure the border. We pay our taxes, and we are entitled to a secure border. It is time to take politics and partisanship out of it and come up with a secure border plan. Please contact your representatives and let them know how you feel. Navajo Canyon’s next meeting will be March 12 at the Brigantine in La Mesa. We will welcome former state Senator Joel Anderson as our speaker. Anderson has long been the cornerstone of Republican politics in East County, receiving 26 legislator-of-the-year awards and co-authoring over 450 bills with the Democrats, even while retaining his most conservative voting record. His local office was a model for meeting the needs of his constituents and giving dozens of young Republicans the experience to serve as interns. Anderson will be discussing the 2020 election and how the San Diego electorate will be involved. The California Republican Party will have their 2019 convention in Sacramento, Feb. 22–24. 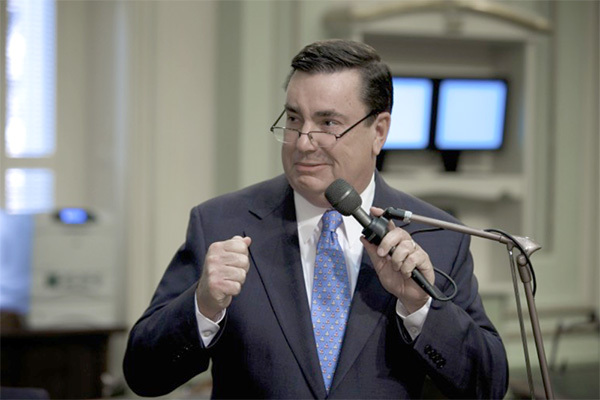 Anderson will discuss the election of a new Republican State Chairman and the future outlook for elections in California as well as what you need to know about ballot harvesting, single-payer health care, cancelling of Prop 13 and much more. Check in begins at 10:30 a.m. for the 11 a.m. meeting. An always-delicious full course lunch is served for a cost of $25. Cash and checks are accepted. Reservations are required, and the room is usually full to capacity. Many months we have a waiting list to attend, so please RSVP early to rsvprwcnc@gmail.com or text Marjie at 619-990-2791. For more information on our activities, please visit our website at RWCNavajo-Canyon.org and check us out on Facebook at Republican Women of California – Navajo Canyon. —Pat Boerner writes on behalf of the Republican Women of California Navajo Canyon.